We still have to choose the finish and tile size. But even now the selection is far from being complete, because, ultimately, we must also take into account the following parameters: water absorption, resistance to friction, physical resistance and durability. Let's take them one at a time. The water absorption of the stone is an extremely useful indicator that proves the resistance of the material to stains. A high water absorption means that the stone can stain because of liquids. The capacity of a stone to absorb water can vary greatly depending on the nature of the stone. Granite and marble have an absorption rate of less than 0.1%, while limestone and sandstone can record a rate of more than 10%. 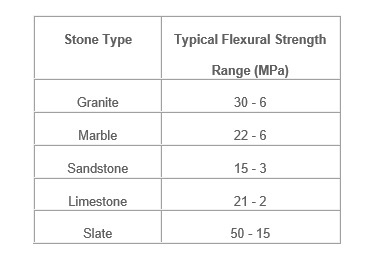 These figures speak for themselves about the characteristics of the material, and especially about the areas where the stones can best be used, as well as about natural stone aftercare. From the table above, we notice that marble indicates a lower absorption degree, which would lead to the conclusion that marble is staining harder. Yet, this indicator does not reveal the whole phenomenon, because we still have to consider the stone composition. Some stains are caused by the chemical interaction between the components of the stone and the staining agent. For example, most of the limestones and marble contain calcite that is sensitive to reaction with acid solutions. Thus, the wine spilled on one of these stones will leave stains not only by the deep penetration of the liquid into the pores of the stone but also by the superficial attack on the surface of the tile. Under these conditions, rocks whose composition is mostly composed of chemically inert (stable) minerals, such as quartz and feldspar (as found in granite), are more likely to withstand superficial staining. Therefore, it is recommended that this type of inert mineral stones be used for flooring in risky areas from this point of view: bath and kitchen countertops, balcony balustrade, etc. On the other hand, the aspect of the tile, determined by the internal structure of the rock, is also important. For example, a granite tile, whose composition is pigmented, can more easily "camouflage" a stain than a white marble tile. The case here is similar to a red wine stain on a red shirt compared to a red wine stain on a white shirt. 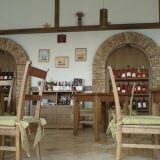 In conclusion, if the area where we install the natural stone is a very transitory and exposed to the risk of encountering frequent spills, it is advisable to choose a water-resistant stone and not to have minerals such as calcite. We will also consider a material that has a rich, variegated vein. Among the stones that meet these conditions we find granite, slate and marble with dense textures. Very important! The rest of natural stone types that do not fit into this category can be used as bath and kitchen countertops if, for example, they are sealed and suitably maintained on time. After all, the choice is made depending on everyone disposition to put more or less effort into the aftercare of that stone. We say this because there are materials that look absolutely fantastic, yet still many people use them in "risky" spaces. 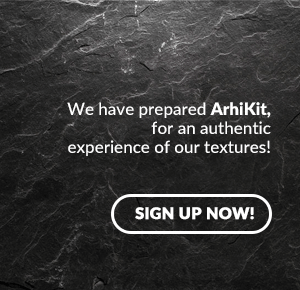 This factor is especially important for stones used in interior design. A low friction resistance leads in time to a significant loss of stone gloss, scratches and a deeper texture degradation. Friction resistance (abrasion) is due to the hardness of the minerals that form the rock and the force between the particles that makes them stay together, to remain compact. Let's take a sandstone plate and a granite tile for comparison. Both tiles contain quartz in a significant proportion. 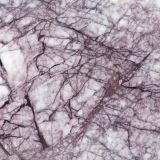 Quartz is a resistant and durable material, yet granite is considered more resistant to friction than sandstone. This different behavior is explained by the fact that particles in the granite composition are tighter, more compact, and in the sandstone their union is achieved by weaker forces and by a less durable clay. Through long-term friction, quartz granules can be displaced from the sandstone tile and on granite quartz granules allow the surface to gradually wear off. A small index indicates low resistance to friction / abrasion. A number greater than 8 is an indicator that is usually considered sufficient, so that tile will be suitable for interior flooring in residential spaces. For commercial or public spaces, generally, if the tile is polished, it must have a friction resistance factor of at least 12. Such a factor will mean the stone's gloss will last longer. Obviously, this indicator needs to be higher for areas with high traffic. Polished surfaces are more sensitive to friction and the traces occurring especially on tiles with monochrome and homogeneous textures can be seen more easily. However, proper care (permanent removal of dust, pebbles and soil accidentally) can reduce the risk of scratch marks. Considering these data, it is advisable to use honed, brushed, tumbled or bush hammered tiles in heavy traffic areas. Pressure resistance (generally called "resistance") is denoted by MPa and describes the minimum required force at which the stone breaks under pressure or flexion (buckling). If we try to break a 23 x 11 cm limestone brick with a 4 MPa pressure resistance, we will need to apply a force of 101,000 Newton, equivalent to approx. 10 tons. Bending resistance is another factor that is extremely relevant for thin and large tiles, such as slabs and half slabs (with lengths ranging from 290 cm to widths of 70 cm). These tiles have a great visual impact on landscaping and are therefore increasingly recommended by architects and designers. Also in this category, where the resistance to flexion is relevant, are also included large stone tiles, slate panels, kitchen countertops and bathroom countertops. As you can see, all types of stone have a fairly high flexural strength spectrum, but even so, figures can predict the chance (the failure!) that the product breaks or cracks during transportation or installation. Another detail, closely related to this flexural strength index, is the size of the product. 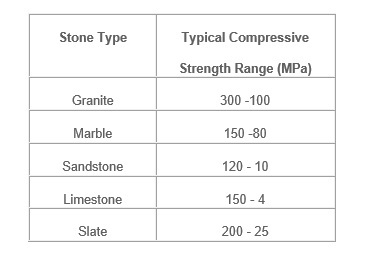 Suppose we have a 30 cm wide, 120 cm long and 1 cm thick granite tile, which has a flexural strength of 10 MPa. We can place the board on two bricks at a distance of 110 cm between them. If we begin to put weights on the tile, when we reach 36 kg it breaks by half. The same material, with the same pressure resistance index, but 2 cm thickness, will break in half to a weight of ... 150 kg. So double thickness, 4 times higher flexural strength. In fact, such a situation cannot happen in real life, the example is given purely to demonstrate the different material response according to thickness, but with the same degree of elasticity, flexion. Some of the conclusions that come out of the above demonstration: a double width of the tile doubles the risk of it bursting, a twice thicker tile will break at a four times the weight and the more resistance high on flexion, the harder it will be for the tile to break or crack. Careful! These are just transport and installation situations. These risks are excluded when the tile, regardless of size, thickness or flexural strength, was suitably installed horizontally or vertically. When we talk about sustainability, we must always think about the resistance of ancient buildings, such as the Parthenon, the Pyramids, and many other temples or theaters that withstand the test of time. The meteorological phenomena that most affect the stone are acid rain and the freeze-thaw cycles. 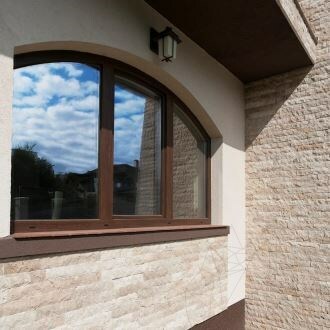 A natural stone that belongs to Grade A can be used for exterior cladding of walls, alleys or pool coping around swimming pools. The stones used in the pool design must have a high degree of durability, so an equivalent value of A or even higher is required. Durability is associated with resistance. Both resistance to pressure and flexion are determined by the link between rock minerals. A tight bond between the mineral particles makes the stone more durable to the mechanical forces created by the crystallization of the salts and processes generated by water freezing. If these mechanical forces born from infiltration of water in the rock are larger than the forces that hold the particles together, the stone may be damaged or chipped. 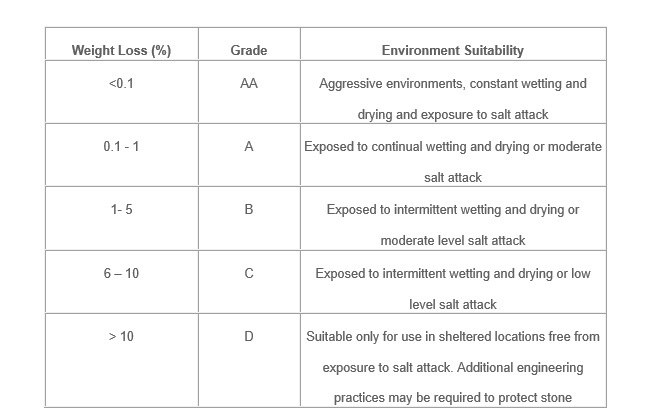 Water absorption is also an indicator for the stone durability. High-level absorption can allow access to dangerous solutions for naturel stone such as salt or acidic water. These solutions can act chemically or physically on the internal structure of the stone. An aggravating factor in AA or A-grade atmospheres is the distribution and the size of the pores: the more pores and the larger the pore size, the greater the risk that the particular stone is affected by the climatic changes described. 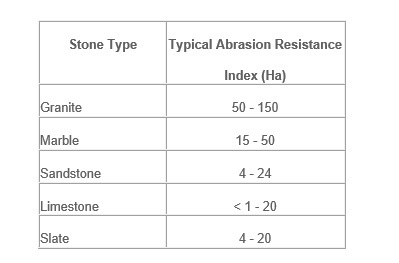 However, if a durable stone (resistance to the salt-rich environment) is required, then we have to choose a stone product with these properties: a small percentage of weight loss following the test described above, a degree of waterproofing and high resistance. All these data presented in the article make us understand the complexity of natural stone used for interior and exterior decoration. Perhaps for some it seems complicated, but any field is complex if you analyze carefully all its details. On the other hand, knowing the details is to master the domain so that we can request the most relevant information at the time of purchase or even before, when we are looking online for the most suitable natural stone for each project individually. 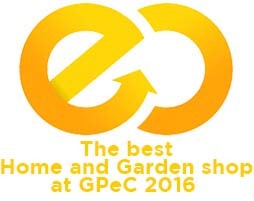 Certainly this article is a good start in solving the problems of everybody with natural stone decoration project. 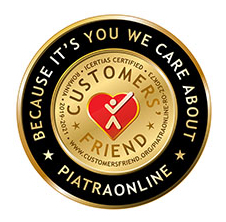 For more information, you can write us an email at export@piatraonline.com, or give us a call at +40318.222.333.